I've had this feeling that we might get hit hard here in the rockies this winter...or possibly something else sooner. I can't put my finger on what it is exactly. We lost power last year a few times last year due to snow, but this coming winter is supposed to be a lot worse. This nagging feeling got to me and I picked up a few things while out today. I got about 20 pounds of chicken that I'm going the pressure can today and tomorrow into broth and chunked meat. 10 pounds of apples that i'm going to turn into apple sauce. I haven't been able to shake this feeling that we need to prepare. I feel a lot better now that we have some things stocked up. I still need to get warm jammies for the kids, some flats of drinking water, and some snow pants for the kids. My biggest hurdle is heat. We were without heat last year due to a broken furnace that took about 2 weeks to replace. That was awful and we even had some space heaters going 24/7. If we lose power, we wouldn't even have that. It was 45 - 50F in our house during that time. We don't have a fireplace or a wood burning stove or anything. Not many options there. Shelly, I think what you have done is a very wise thing to do. Kevin and I both have a feeling that this winter is going to be rough. He said this weekend he will get the kerosene heater out, burn off the old kerosene and get it ready for this winter with fresh kerosene. I do not like burning the kerosene heater, but if we lose power in our little house, we will have no heat at all. We bought this heater a couple of years ago. So far only had to use it once for just a few hours. We both remember vividly the 2007 ice storm when everyone in our area was without power for days. We had no power for a full 7 days. Thankfully, we were burning wood at that time and was able to keep the house warm. We also have lanterns so we will have light. We bought an inverter to keep the freezers going in 2007. We do have a small and large generator. Did not have that in 2007. As far as food goes, we could last for a while with what he always keep on hand. I buy dried pinto beans in 20 lb bags. I always keep brown rice on hand and some gluten free pasta. We have lots of canned goods. We would eat perishables from the freezer first if we lost power for a long time because the amount of gas it would take for the generators would not be cheap. Kevin always tries to keep at least 5 gallons of gas on hand int he winter. He uses something called Stabil in it to keep it fresh. I always have a deck of cards, fresh batteries, and some kind of handwork ready to go. I played solitary so much I was sick of it in 2007, but I did not have much hand work prepared, and didn't have enough light to read much. Let's hope our feelings are wrong and it is a nice winter, but I am not counting on it. This is a good thread for all of us to help each other out with ideas. I've heard more than one person say we're in for a rough winter. I hope we're not, but better to be prepared than caught offguard. We will go next month and do a winter stock up. I plan on getting bottled water, matches, camp stove fuel, lamp oil, extra wicks, batteries, and charcoal. I'll be adding to my list as I think of things. Like Winona, we'd have to eat the perishables from the freezer first. I have a pretty good stock of canned goods (home canned and store bought) so we should be ok in the food department. We have a small generator but don't have any gasoline stored. We heat with wood and we don't have near enough yet to last all winter, so that's one area we need to work on. This is a great thread for us to share ideas. Thanks for the graphic, Leah. 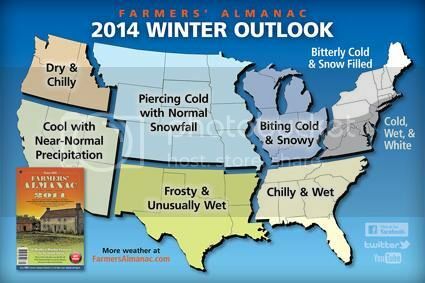 I heard that the Farmers' Almanac is accurate 80% of the time. I need to get motivated and get things in order here for winter....first thing is canned veggies, I managed to go through my pantry supply I had stored. I've been hoping Kroger would put their Freshlike brand at .$50 a can but it's not happened. I may just visit Aldi's and buy there. I have lots of lamp oil stored, I love oil lamps and have many around my house. Dh has our wood supply in and its split & stacked. Our generator is ready to go, dh wired the house to easily switch to the generator if need be. I have bought several long neck lighters. We have a 1/4 beef in the freezer, I need to buy chicken breast and bacon to freeze too. We also need to buy the special ice melt that doesn't harm concrete. out! I guess all in all we are mostly prepared but I will think harder on the subject and get the rest of what we need before the harsh winter sets in. Shelly look into a small buddy heater they sale them at walmart and atwoods when it gets colder we have one we never had toused but then bought a second one last year when they came out with one that has a sensor on it for harmful gasses and makes it turn off or alerts you cant remember which one but they run on the little bottles of propane. I just went thru the pantry and made a list while I was putting stuff back on the shelves we built sunday. We have a lot of green beans, peas and corn bc walmart had a 4 pack of libbys last winter for $2 hope they have that sale again. Need to stock up on a lot of other can foods since we didn't have a garden this year. I also need more paper products, matches, lamp, oil, batteries. Man my list keeps getting longer and longer I hope hubbys work picks up. Thanks for the graphic, Leah. It says it will be normal precipitation in my area, but even with normal, we've lost power. Anyway, maybe it's not snow, but something else? I just feel nervous this year and deciding to act on it. If I never need it, great. I guess I'll just be prepared for next summer's camping. Marvins started a pretty good 10 for 10 sale today I picked up some today but going back tomorrow to get some Campbell's chicken and noodles, mater soup and similar items that will heat up quickly on a camp stove if we loose power figure they will be more filling that Ramen noodles yuck lol. Good idea about the case of diapers. I hadn't even considered that. All we have in the house right now is cloth. That could become a problem after 1 day around here. Will definitely be doing the same. I mentioned this thread to Jean and how I wanted to start prepping our winter supplies. He came home that night with brochures for whole home generators . Love that boy!